Welcome to the official website of TerraStar Building Products Inc. We are northern Ontario’s premier manufacturer of high quality roll-formed steel roofing and siding products used for Residential, Commercial, Industrial and Agricultural building applications. We offer a complete line of metal cladding materials including a full range of associated trims and accessories. TerraStar Building Products proudly upholds the principles of clear and friendly communications coupled with excellent products, competitive pricing, prompt service, on time deliveries and after the sale follow-ups. We aim to ensure the highest level in customer satisfaction through our personalized service and welcome the opportunity to work closely with all prospective clients when planning future building and renovation projects. Please contact us today for your building needs; and please accept our gratitude for your interest in TerraStar Building Products. We value and appreciate your business. Click here to download the TerraStar Building Products Brochure. 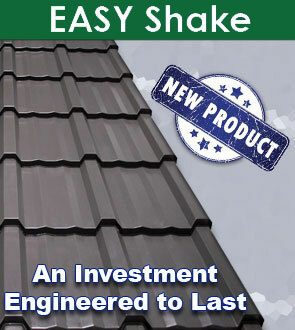 - TerraStar Building Products is a proud northern Ontario distributor of Easy Shake metal roofing.